15 Offbeat and Statement Rings for brides-to-be! Remember those days when your mother used to carry a royal look in that gorgeous banarasi sari wearing multiple huge rings and you simply couldn’t stop drooling over it? 2. The golden and ivory ring that’s definitely ruling hearts! 3. Flower shaped ivory ring for pastel shades trousseau! 4. Mirror embellished ring for your dhinchak Mehndi! 5. Traditional ring with pearly edges! 6. 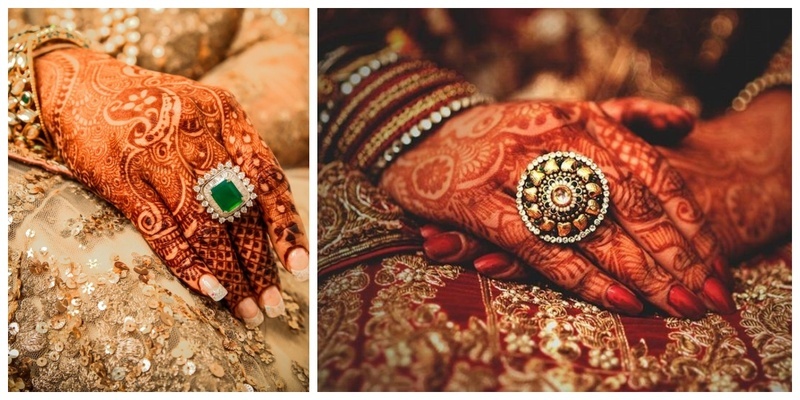 Kundan and Polki rings for the bride to be! 7. Seashell ring with a beautiful pearl in the centre! 8. Golden traditional jewellery with with pearl bead latkans! 9. The moon to my stars ring with a statement mirror in the centre! 10. The marine life ring for an offbeat bride! 12. Quirky aqua blue and golden ring for a fun Mehndi afternoon! 14. Midi rings for a not so mainstream bride! 15. Trail of rings for all the fingers! So my lovely brides-to-be, kick up your heels for its time for some ring shopping!